It’s amazing to think that Marvel started us on this ride through their Marvel Cinematic Universe seven years ago and is now on its twelfth movie. We’ve seen an eccentric billionaire, a demi-God, highly skilled human agents, super soldiers and, well, Hulk. While not everyone is familiar with every member of the Avengers, those chosen pre-2014 were pretty safe bets to be successful both commercially and critically. After much success and multiple iterations of each, Marvel decided it was a good time to take a bit of a risk by bring Guardians of the Galaxy to the screen. The band of misfit space outlaws wasn’t well known and most weren’t sure how it would be. Well, it was a huge success and easily one of my personal favorite Marvel movies to date. So when Marvel announced Ant-Man and I wasn’t immediately wowed by the trailer, I decided to stop worrying about it because I figured Marvel knew what they were doing. I was right. Full disclosure, I love Paul Rudd. 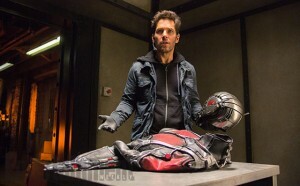 He’s had very few roles that I haven’t liked and although this will always be my first thought of him, I had faith in him to have at least a decent outing in Ant-Man. I wasn’t prepared for how good the movie actually was. I will do my best to avoid even minor spoilers, but, hey, you’ve been warned. Ant-Man follows Scott Lang (Paul Rudd), a failed burglar who is desperately trying to turn his life around to be a better father for his daughter Cassie (Abby Ryder Fortson). 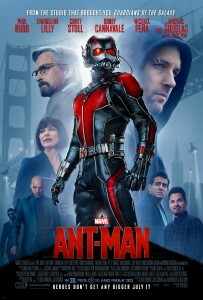 As he’s struggling with redemption, he has a run in with brilliant scientist Hank Pym (Michael Douglas) who is the creator of the Ant-Man suit. 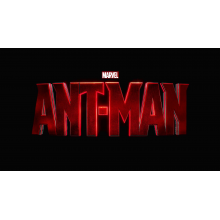 At the center of the movies dynamic is Hope van Dyne (Evangeline Lilly) – Hank’s reluctant ally, and daughter. It’s clear that there’s a lot of resentment that must be bridged for the trio to work together, that fleshes out well over the course of the movie, especially as Lang attempts to harness and learn his new powers. Their main goal is to stop the Pym Particle (the technology behind the Ant-Man suit) from getting into the wrong hands. As they progress through their plan, they realize they can’t do it by themselves and bring in Scott’s former heist buddies Luis (Michael Peña), Kurt (David Dastmalchian) and Dave (Tip “T.I.” Harris). Each has their own unique set of skills and personalities that mesh beautifully together and add another great level of comedic timing to the film. Peña was especially brilliant in his role. It wouldn’t be a super hero movie without a good villain and that’s where Corey Stoll comes in as he portrays Darren Cross, a former assistant and protégé to Hank Pym. Cross has spent his entire life trying to replicate the Pym Particle and as he nears the discovery, he creates the Yellowjacket suit. Driven by his innate need to receive approval from Hank Pym, he goes astray and becomes a danger to not only himself, but the world and the MCU as a whole. While I thought that Stoll did a superb job as Cross, as has been one of the major drawbacks of the MCU to date – the villains don’t get hashed out to the extent required to truly feel menacing. 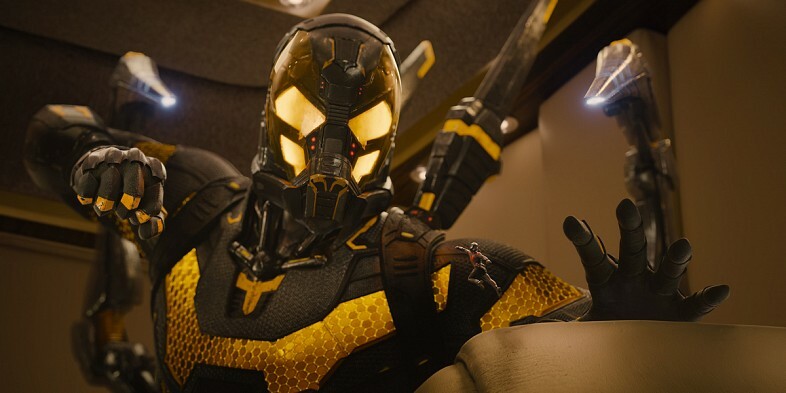 Yellowjacket, Ronan (Guardians of the Galaxy), The Mandarin (Iron Man 3), Malekith (Thor: The Dark World) and many others have just never been given the screen time to really hit home and therefore have never been that menacing. While I understand the necessity for newer franchises like Ant-Man and Guardians of the Galaxy to focus more on the characters who will probably be around past one film in the MCU, it’s still disappointing to not see some truly terrifying villains. One of the most important things for me going into Ant-Man was that the movie felt like a fresh standalone movie that didn’t ride the coat tails of other Marvel movies, but still had a great tie in to the MCU and that’s exactly what I got. With the MCU spanning twelve movies so far (with ten more scheduled) and two TV shows (Agents of S.H.I.E.L.D. and Agent Carter), it’s amazing to see that so many new characters are still being added on a yearly basis. 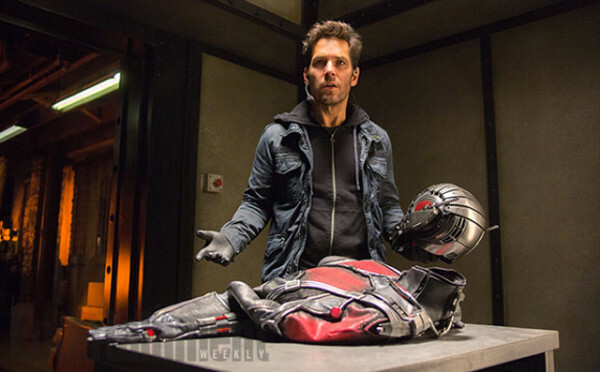 Ant-Man manages to feel fresh, familiar and engaging all at the same time. The cast is cohesive and skilled while blending both the comedic and dramatic elements of the film that should do well to keep all movie goers entertained for the movies two hours run time. You can tell a lot about someone based on how they rank Marvel’s movies and for me this would rate just below Captain America: The Winter Soldier and Guardians of the Galaxy. And for those wondering, you’ll be wanting to wait through until the second end-credits scene. You won’t regret it. And if you’ve already seen it, but are a bit confused by it, here’s an explanation. Naturally: SPOILERS. + Paul Rudd silences doubters. + Great balance between humor and action. + Nods to the MCU are subtle but great. - Slow pacing to start. - Yellowjacket needed more screen time.